On my recent visit to San Diego, I got to see one of my favorite ducks, a merganser. Mergansers are fish-eating diving ducks. Here’s a Red-breasted Merganser (Mergus serrator), diving in San Diego Bay, viewed from the Coronado Aquatics Center, on the Coronado Strand. Mergansers have bills adapted to catch their prey, which are quite different from those of other ducks or, indeed, birds in general. Instead of the broad, flattened bill typical of ducks (the origin of the term ‘duckbilled’), their bills are long and narrow. And, though all modern birds lack teeth, there are a series of tooth-like serrations on the bills of mergansers which help them grab fish, frogs, and the like. 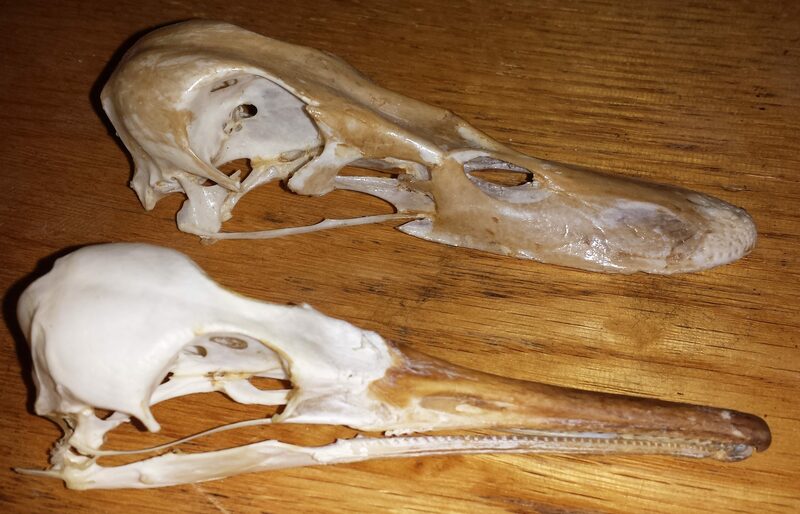 Skulls of a mallard (Anas platyrhynchos), top, and a merganser, bottom. There are some geese that have similar structures on their bills, but they are more like transverse grooves rather than serrations. Geese are typical Anseriformes (the order to which ducks, geese, and swans belong) in their feeding habits, and do not catch fish; it is interesting that the only birds I know of with these approximations to teeth are in that order. Close up of the bill of a merganser, showing tooth-like serrations. I also saw a Surf Scoter (Melanitta perspicillata), another diving duck, also at the Aquatics Center. The body of water here is Glorietta Bay, a part of San Diego Bay enclosed by Coronado “Island”, the Strand which connects Coronado “Island” to the mainland (the reason Coronado “Island” is not an island), and a landfill extending from the Strand on which a Navy base is located. The scoters have broad bills, but they’re higher in the back (unlike mallards), and they feed on mollusks. The bird in the video above is a male, as you can tell from the white markings on its head and neck. I saw several more Surf Scoters while sailing in San Diego Bay off National City, flying just above the water in small groups, but unfortunately did not get any photos. Both of these species of duck breed mostly on fresh water in the taiga and high arctic, and winter along the sea coasts, so it was a rare opportunity for me to see them. 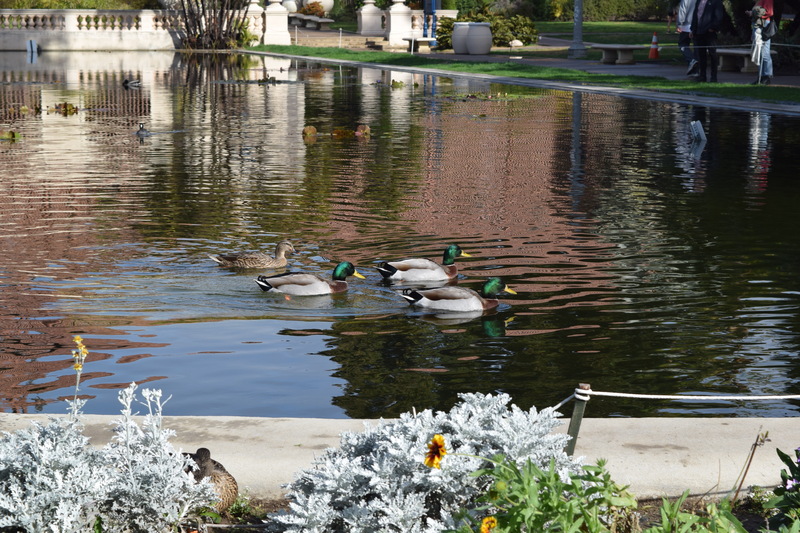 On two visits to Balboa Park, at the Lily Pond in front of Botanical Building, there were Mallards (Anas platyrhynchos), Jerry’s favorite species of duck. Mallards (Anas platyrhynchos), Balboa Park, San Diego, California, January 16 2019; note the female sleeping on shore amongst the flowers. 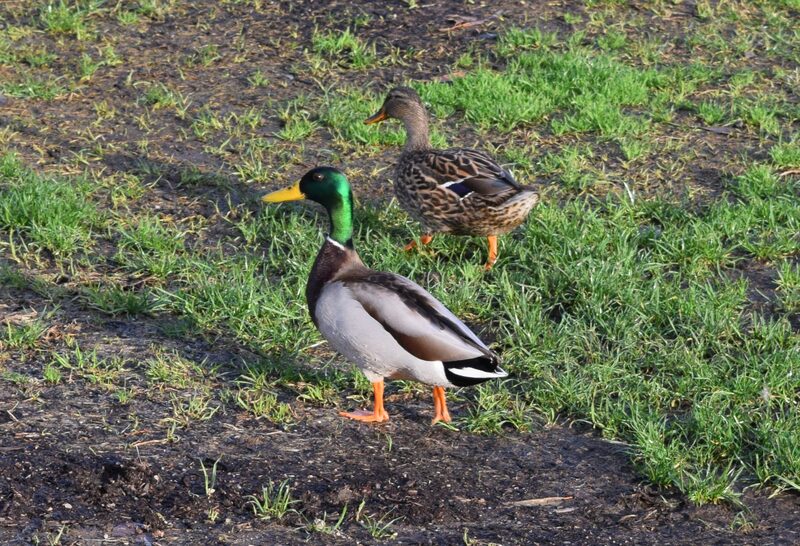 I have often noted an excess of males when observing Mallards (often two males with a single female), as in the photo above, but I don’t know why that’s the case; a pair walked about near the pond. Mallards (Anas platyrhynchos), Balboa Park, San Diego, California, January 16 2019. 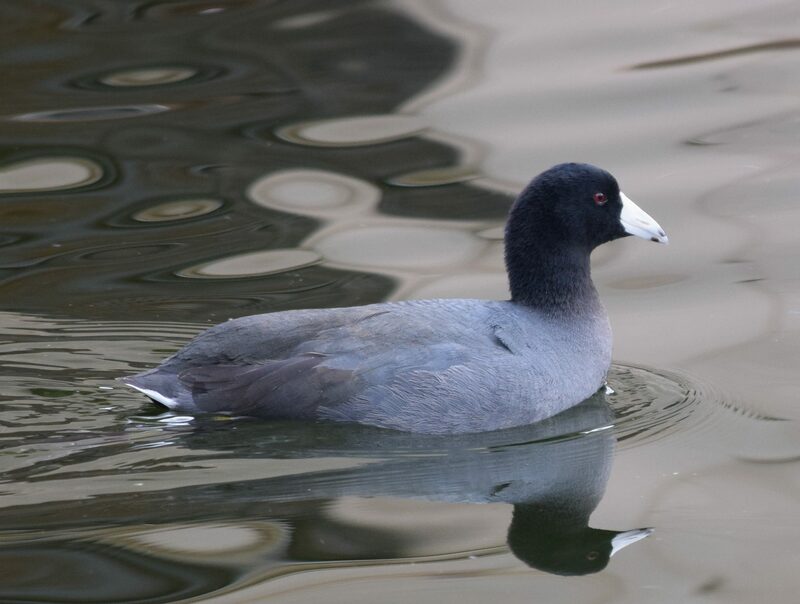 As Cornell’s All About Birds reminds us, not everything that floats is a duck, and on a later visit to Balboa Park, I photographed this American Coot (Fulica americana). There were also more Mallards about that day—I counted 22 at the Pond. American Coot (Fulica americana), Balboa Park, San Diego, California, January 18, 2019. 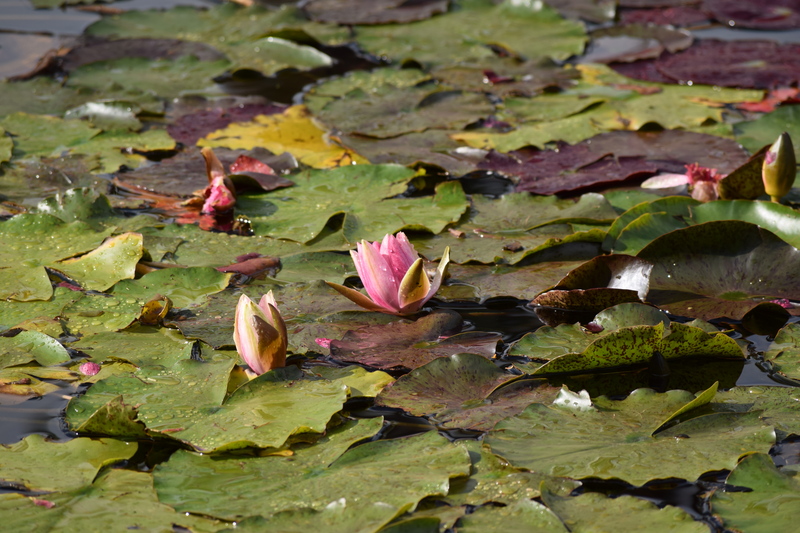 The Lilly Pond did have a few lily pads. Lily pads, Balboa Park, San Diego, California , January 18, 2019. 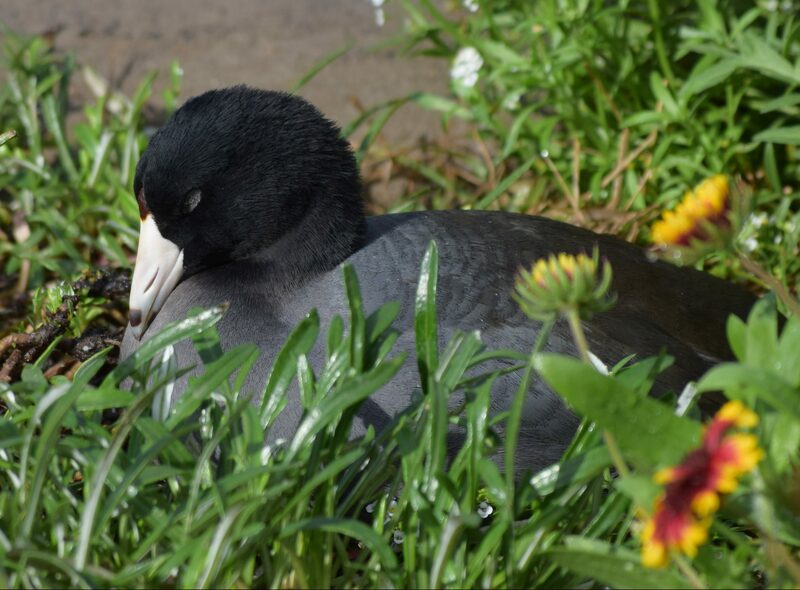 This entry was written by whyevolutionistrue and posted on February 7, 2019 at 1:15 pm and filed under birds, ducks with tags American Coot, Balboa Park, Coronado, ducks, Mallard, Red-reasted Merganser, San Diego, Surf Scoter. Bookmark the permalink. Follow any comments here with the RSS feed for this post. Both comments and trackbacks are currently closed. I have to ask – If birds are dinosaurs why don’t they have teeth? Do teeth have unlimited evolutionary potential or is there something about them that they don’t appear in birds – like weight, or resources? Early birds had teeth, advanced ones lost them. Not only have they weight, but it is in the frontal part of the head and therefore would destabilize flight. Birds, unlike bats, could afford discarding their teeth because they have a gizzard where ingested stones (gastroliths) act as substitute teeth. Resources would seem to be the answer! All birds came from theropod dinosaurs & as far as I can tell the early avians all had teeth. Teeth were lost repeatedly in various lineages of early birds & the lineages that didn’t lose teeth are all extinct – the big space rock that hit near Mexico 66 million years ago did ’em all in. …birds gave up teeth to speed up egg hatching, a research paper published Wednesday suggests, challenging long-held scientific views on the evolution of the toothless beak. But, please read the whole link as I’ve only quoted the first half & there’s interesting stuffz in the second half. I recall reading that perhaps the lack of teeth in birds, and the reliance on seeds and such rather the meat or vegetable matter, may have contributed to the survival of ancestral birds during the extinction event that wiped out the dinosaurs. I don’t recall where I read this, but it probably came from something posted or discussed by Darren Naish. What his take on this was, I cannot recall. “Weight” is normally given as the reason for losing the teeth (multiple times) in the early bird lineages, but Michael’s point about the time to develop tooth buds is well taken. Some time back in the 1980s or early 90s, one of the idea-and-experiment sets that matured into the topic of evo-devo – the interaction of evolution and (embryological) development – was being developed by applying developmental cue molecules from extant “reptiles” to hen chicks in the egg. By applying the right chemicals to the jaw-edge of the common hen, they could get it to start growing tooth buds. The developmental pathways not used since some time in the Cretaceous could still be triggered by providing a couple of growth factors which still perform that job in lizards or crocodiles. Or, to put the same idea differently, some time in the Cretaceous, some ur-Vogel had a mutation, stopped producing one or two chemicals, stopped making teeth, and it’s descendants did well enough in eating with it’s gum-ridges to produce more chicks than their toothy cousins. Someone more interested in human development may have a handle on how common it is for infant humans to fail to develop teeth completely, or even more interestingly, on one side or the other. I don’t know names or numbers, but I bet it’s not a rare mutation. In the OP, there are two links– “modern birds” and “lack teeth” — to news articles about two papers, one to a paper from 2014, showing that all modern birds share the same tooth-disabling mutations, showing that toothlessness in modern birds derives from a single common ancestor (this does not prove toothlessness arose once, only that only one origin of toothlessness has survived to the present); and the other, from last year, proposes that toothless parts of beaks arose for greater dexterity (an alternative to other reasons cited by other readers, including that in the paper, from about the same time last year, cited by Michael Fisher, on incubation periods). Thanks a lot – very interesting! Interesting information about the Mergansers, especially their beak structure. They’re a favorite of mine, too. Thanks. I think the coot gets a bum rap while the merganser gets a pass in the name of ducks. If you’re still there (or next time you are), my favorite San Diego birding spot is the levee along the left bank near the mouth of the San Diego River. There is easy access from the San Diego Dog Beach, for which there is ample parking. Just walk away from where the dogs are headed, i.e., go upstream. It is so far south that it gets a nice mix of ducks and waders that are more typical of Mexico and very different from what I see here in Utah. Perhaps the neatest thing is the fairly reliable presence of black skimmers in action. I find the merganser a very interesting bird. We’ve seen a few locally. I didn’t know about the beak serrations that make them good fish catchers. The Australian tooth-billed bowerbird supposedly has ‘toothy’ protrusions of the bill that function like true teeth, but I can’t find a picture that shows this. Strange. Nice! Mergansers evolved the same narrow jaws for rapid motion thru water like fish-eating crocodiles. Amazed no one has mentioned the pelagornithids, big to huge seabirds with really wicked looking pseudoteeth. They are extinct but made it all the way from the Paleocene to Pleistocene. Little ones were albatross sized, big ones rivalled the largest pterosaurs in wingspan. Greg – Roving WEIT Duck correspondent!